The skills and behaviors that feed and enable your resilience are critically important to develop and nurture now more than ever. The combustive cocktail of daily public provocations associated with political, social, and natural disasters, the pervasiveness and popularity to be mean and demean others, along with our ever-present personal challenges increase the likelihood that our contingency plans (aka Plan B), will one day move from thought to reality. 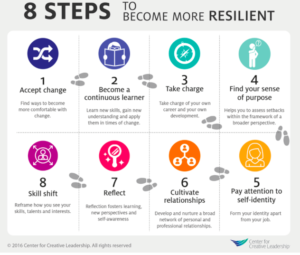 The Center for Creative Leadership defines resiliency as the ability to bounce back from a difficult moment, a rough day, a big setback, or a life-changing hardship. Resilience is also about tapping into what you need daily to avoid paralysis when you can’t see thru the forest or when you just don’t know the next move. While deeply personal resiliency, has profound business implications. A global survey of over 100,000 employees found that employee depression, stress and anxiety accounted for 82.6% of all emotional health cases in Employee Assistance Programs in 2014. This is an increase from 55.2% in 2012. What I know for sure is that when people are sad, angry, reactive, and anxious they are unable to be at their best in any role. Decision-making and interpersonal interactions take a hit. The good news is like most things resiliency can be learned. It is built by a set of attitudes and behaviors associated with optimism, flexibility, continuous learning, creativity, confidence, mindfulness, and vision orientation. Being receptive to feedback; requesting feedback; and responding by acting on the feedback. Willingly take bold risks and try new approaches & ideas. Having a vision for change. Embrace change. Inspiring others to change. Decisive effective decision-making enabling forward motion. When you misstep, quickly edit and course correct. The race isn’t given to the swift, nor to the strong, but to the one that endures to the end (Ecclesiastes 9:11). Flex those new muscles that surviving the experience created.?? 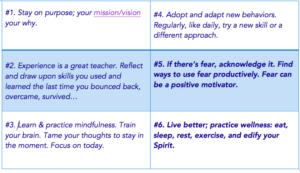 Use the learning to relaunch, redirect, transform… Take a step, make a move, fly, soar, leap… whatever. 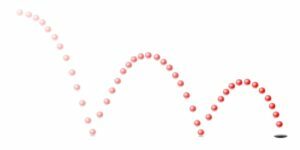 Maintain your bounce to live and live well.